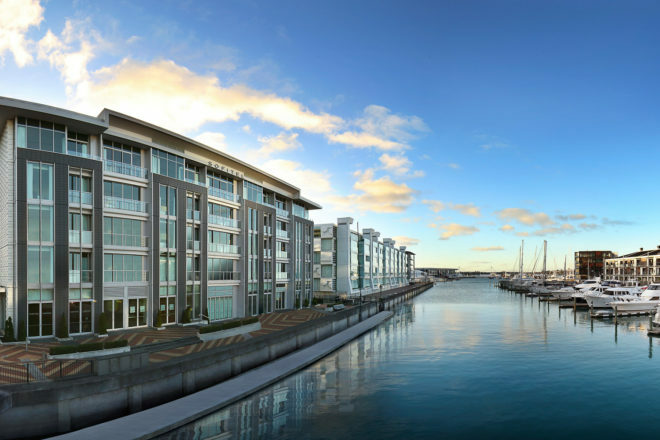 The new Sofitel Auckland property boasts a luxury marina view. 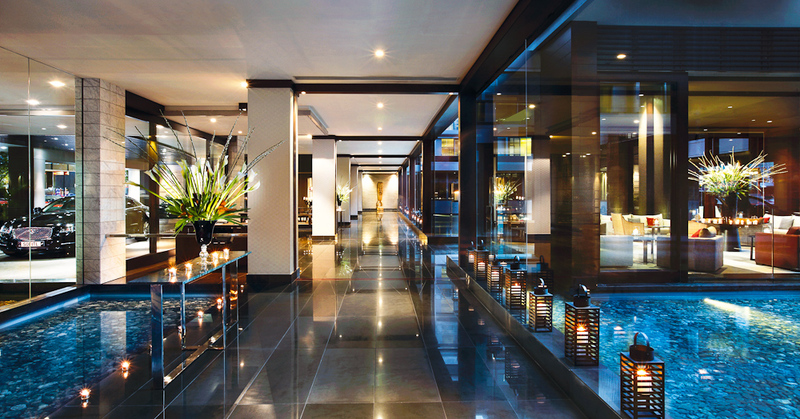 You can always rely on a luxury world-class brand like the Sofitel, right? Quentin Long tests this theory in its new Auckland property. When visiting Auckland in the past, my standard go-to business hotel has always been the Heritage Auckland, a converted department store with high ceilings and huge rooms; it’s a safe bet, which is what you need when travelling for work. But on a recent trip I decided to give a newcomer on the landscape further investigation. The Sofitel Viaduct Auckland opened in 2012, but in spite of its well-known name and convenient location, it seems to fly completely under the radar in these parts. The hotel sits within a much larger apartment development, so its sense of grandeur is a little thwarted by the residential buildings surrounding it. From the street it is clear that the building is in fact two towers joined at the base by the lobby. The development then continues in parallel buildings split by a central canal with moorings for small boats. It looks cute, if a little ‘compact’. A great concierge once said that a hotel’s lobby should be the stage for the theatre, with staff taking the lead roles in the drama. There is no single stage on which the theatrics are focused in the Sofitel’s lobby – there are too many spaces. There is one big hallway that surrounds a large reflection pool with a huge stone Tiki at its centre, and a waterfall feature, which is certainly striking – particularly at night when a video is projected onto the cascading water – although it would be better if this was a pure visual arts piece rather than a vehicle for promoting the hotel’s sub par restaurants (more on that later). It all seems slightly tacky for such a sophisticated brand. There are several sitting areas located along the lobby’s length, with the check-in desk tucked away in a far corner. Huge amounts of glass allow natural light to flood the space and offer glimpses of the central canal, but the rain streaks on the outside make it feel a little drab. The colour palette of dark grey and black marble doesn’t help either, and when added to the giant lion statues that stand guard at the entrance, it comes across as a hotel unapologetic in its pursuit of mainland Chinese tourists. Upstairs, my marina view room is huge. A small kitchenette is snuck into the atrium wall, which gives way to a large sleeping area and ensuite (with bath), all decked out in relatively predictable high-end corporate hotel décor. An entire wall of floor-to-ceiling windows indeed takes advantage of the marina views, but the majority of the vista is of the apartments that dominate the development. I watch the occupant of one prep his dinner, while across the canal from him a woman is giving herself the once over before heading out. I feel like Jimmy Stewart in Rear Window, sans wheelchair and Grace Kelly. Eschewing my in-room kitchen, I decide to check out the hotel’s two eateries, a restaurant and a café, located side by side. And here is the elephant in the room: the food is not great. For lunch at the 21 Viaduct Café, I order the crisp chicken and coleslaw bap, which is neither amazing nor offensive. For dinner I dine at the signature restaurant Lava Dining – where there’s a regular fins, feather, fur menu – and order pork belly. The accompanying black pudding was lightly crusted, not soft and tacky as the best of the dark blood sausage should be. Overall, it’s disappointing. The real winner in the Sofitel Viaduct Auckland has to be Sabrage, the bar (if, like me, you were wondering, a ‘sabrage’ is the sabre used to traditionally open a bottle of champagne). A gold and brown bar with soft lighting, this space is where the hotel starts living up to the high Sofitel standards. I sneak into the private lovers lounge for a glass of wine, a snack and to do some work. It’s fantastic. The Sofitel brand comes with some lofty expectations and although the staff is well up to the standard, it’s a shame some other aspects of the theatre are not playing their parts well. Quentin paid $408 for a Luxury Marina View room.